Schlosser Designs: Ready for the next installment? This set is called Bough-tiful Blessings. (Hope that's not too cheesy!) It comes with a whopping 39 stamps. The branch/tree (depends on which way you stamp it) is 4 1/2" long. The perfect size for a card or scrapbook page element. I am soooo excited about this set because of all the different possibilities! 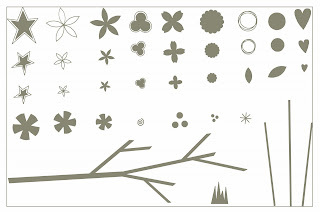 The branch can have so many different things stamped with it: stars for birthdays, flowers, leaves and berries, hearts for valentines day, cherry blossoms.... you get the idea. Also included are some small swirls, dots, and starbursts that can be used separately, or layered on top of the other shapes to make a center. These are easy to layout with your clear acrylic blocks and can be laid out however you want! I've also included three different stems, that you can add flowers and leaves to. LOVE this! It's so exciting to finally see your stamp designs... they're awesome! This one is very cute and a great deal for what you get! Man! You are killing me! These are so cute too! And seriously, they are a great price! Thanks guys so much for all the encouraging comments! I'm glad you like them! So awesome! I'm totally going to be your most loyal customer!! !